Larionov and Goncharova travelled to Spain for the first time in the summer of 1916: Larionov's passport carries the border guard's stamp indicating that he crossed the Spanish border in the vicinity of San Sebastián on July 14 1916. As was often the case in the couple's life, this journey was initiated by Sergei Diaghilev. In essence, it was more of a business trip: Diaghilev's company "Ballets Russes" had come to Madrid on tour, and Diaghilev invited the artists to come and resume their work on the ballet "Liturgy". In San Sebastián the team set about working on a new production, the choreographic suite "Les contes russes" (Russian Fairy Tales)1: the suite's first piece, a one-act ballet "Kikimora", premiered at the Teatro Victoria Eugenia (the Victoria Eugenie of Battenberg Theatre) there on August 25 1916. The Spanish tour was a success; the company was patronized by none other than Spain's monarch Alfonso XLLI, who attended every premiere and often visited the rehearsals2. After the performances in San Sebastián, Diaghilev and Léonide Massine, in the company of Larionova and Goncharova, travelled extensively across Spain. 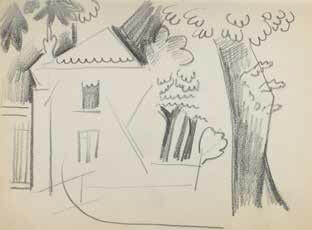 "We visited Burgas, Seville, Avila, Madrid,"3 Goncharova wrote. The travellers spent the mornings and afternoons familiarizing themselves with the local architecture, nature and visual art, and the nights in taverns with Spanish music and flamenco dancers. "We often watched Spanish dancers in small theatres or, rather, night taverns, where local dancers did their performances and the guitar played. Although some of the steps were risqué and the public very expansive, earnestness, as well as respect for the artists and their art, and for the woman, prevailed among the spectators. "4 The artists' archive contains a photograph of one such tavern scene. The importance of the Spanish productions for Goncharova can be judged by the fact that at her subsequent exhibitions (not all of which were devoted to theatre work) she always displayed her sketches of the décor and, especially, costumes for "Spain" and "Triana". These images took on a life of their own, acquiring the status of "pure art", after which, quite naturally, they were committed to canvas with oil paint. 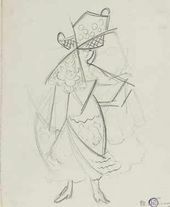 The famous "Orange Vendor" (1916, Museum Ludwig, Cologne) is in essence a soaied-up stage costume, and the drawings featuring a real-life Spanish woman with a plate with oranges, held at the Tretyakov Gallery, can be equally regarded as outlines of a stage costume and as preparatory drawings for a painting. 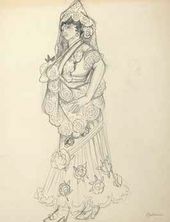 Some such paintings are known only from photographs (held in the Department of Manuscripts of the Tretyakov Gallery), and they resemble very much the costume sketches for the unrealized productions. Goncharova's Spanish pieces, displayed after the artists' return to Paris at exhibitions at the Sauvage and Barbazanges galleries, whose openings were attended by all of Parisian fashionable society, defined Goncharova's "specialization": in the years that followed her services as a designer were often called on for Spanish-themed productions, ballets and even dramas. And she always agreed with pleasure, in each case seeking a new source of inspiration, a new take on the theme. 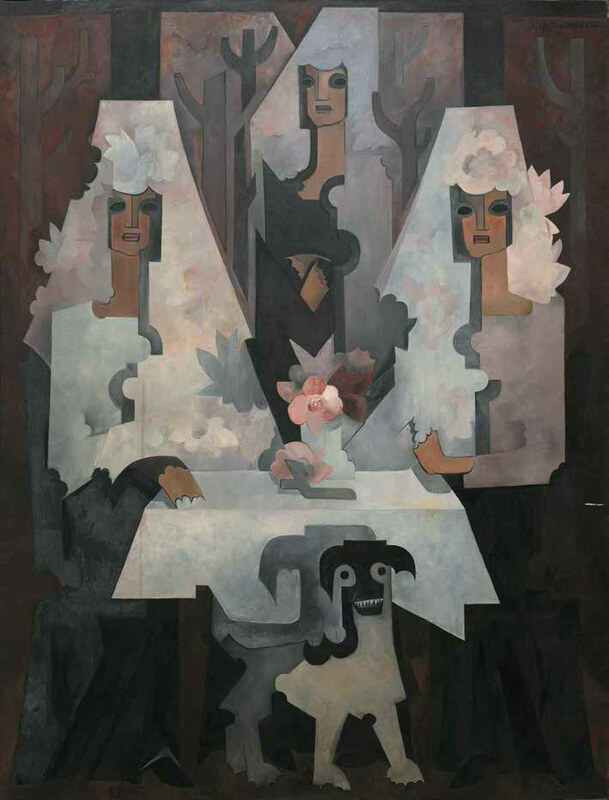 In 1932 Bronislava Nijinska20 directed Ravel's "Bolero", with Goncharova's sets and costumes, and in 1935 Goncharova designed de Falla's "Love the Magician" for the Woizikowsky company21. But perhaps the most interesting among the Spanish productions of this later period was the ballet "Goyescas" to the music of Enrique Granados22. As a composer, Granados drew on folk themes, and the piano suite "Goyescas" was inspired by the compositions of the celebrated Spanish artist Francisco Goya. Book I - including "Gallant Confessions", "Variations on TonadiUa", "Conversation Through the Grille", “Quejas, o La Maja у el ruiseñor" (Complaint, or the Girl and the Nightingale), “El fandango de candil" (Fandango by Candlelight)" - was subtitled "Los majos enamorados (The Gallants in Love) and provoked associations with scenes from the life of majas and majos (fashionable ladies and gentlemen). 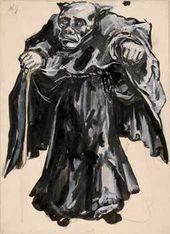 Book LL, which included pieces titled “El Amor у la muerte (Balada)" (Ballad of Love and Death), “El fandango de candil" (Fandango by Candlelight)" and “Epilogo: Serenata del espectro" (Epilogue: Serenade to a Spectre), was in the spirit of Goya's "Caprichos". The opera of the same name developed from the piano suite, with fragments from the opera used in the making of the one-act ballet. 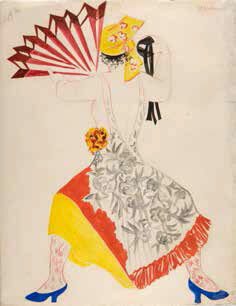 In 1940 the Théâtre Marigny in Paris signed Goncharova as the designer for the production. There was perhaps an element of fate about this: although Goncharova never met Granados, several times the artist and the composer came very close to crossing paths. 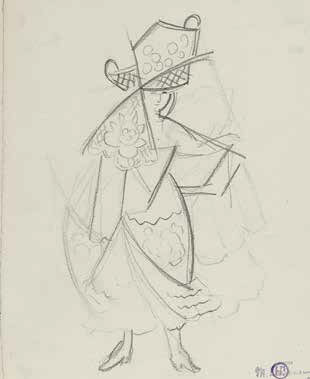 In 1914, when Goncharova was enjoying her Paris success at the premiere of "Le coq d'or" (The Golden Cockerel), Granados performed the "Goyescas" in Paris to much acclaim, and the French Academy of Music commissioned from him the opera of the same name. 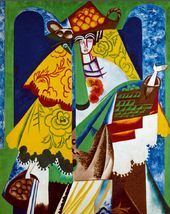 The opera premiered in 1916, when Goncharova was for the first time addressing Spanish themes, designing the ballets "Spain" and "Triana" for Diaghllev. The libretto tells the story of the beautiful maja Rosario and her two competing suitors, Fernando and the toreador Paquiro, with a tragic denouement, followed by a surprise epilogue - a scene with fantastic apparitions, performed to "Serenade to a Spectre". In the one-act ballet the main emphasis was precisely on the Caprichos theme. The ballet was directed by the dancer and choreographer Victor Gsovsky23, but he was most llkeiy assisted in his work by his wife Tatjana, the ballerina and choreographer24. The premiere was on December 8 1940 at the Theatre Marigny, as part of a concert titled "Des baiadins". Designing the ballet, Goncharova, like the composer, drew on Goya's works. What she sought was not stylization but to capture the atmosphere of Goya's compositions. As an artist, Goncharova feit and sensed 18th-century Spain as if through the lenses of Goya's genre scenes and “Caprichos", as well as his murals for the Quinta del Sordo (Vllia of the Deaf)25. The ballet's colour scheme was entirely inspired by Goya's art, with exquisite combinations of the artist's favourite shades of colour: black, grey and rose in the sketches of the main characters combine with the spectral-grey and black hues of the shapeless costumes of the monsters and fiends from the phantasmagoric other world of the "Spectres". Goncharova devised the masks and special mantillas (shawls), which enabled the corps de ballet dancers to instantaneously change their appearance without changing costume. 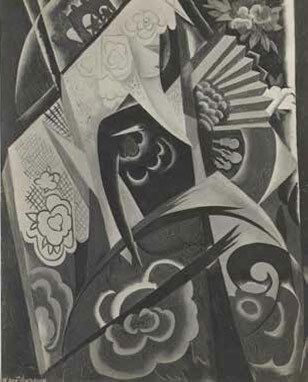 It appears that the "Spanish" theatrical assignments, which became a sort of core motif for Goncharova, every time generated a new series of compositions - paintings and murais themed on Spain, Because for Goncharova the painter - and she thought of herself as a painter above all else - the main gift she received from Spain was a new theme for her artwork, "In Spain we worked a lot and saw many different things, When I returned to Paris, I started creating images of Spanish women in colours suggested to me by this country's atmosphere, Now my compositions featured red-brown, black and white, without yellow, red, violet and orange - and featured Spanish women of very fair or strong colours,"26 she wrote later. When she settled in Paris, in a studio on Rue Visconti, Goncharova finally had the opportunity to resume painting and working on large art forms, In 1922, when she was engaged to design the interior of the celebrated musician and conductor Serge Koussevitzky's mansion, Goncharova created for the dining-room a huge mural "Spanish Women" (now in a private collection), The cooler, silvery-blue colour scheme appears more in tune with the sombre sound of the guitar than with the bright décorative patterns of Spanish traditional costumes, The compositions from the "Spanish Women" series are evidence of Goncharova's fondness for monumental art forms, In her Russian period this streak appeared in her religious compositions such as "Eider with Seven Stars" (1910, Tretyakov Gallery), "The Saviour" (a triptych, 1910-1911, Tretyakov Gallery) and the famous tetraptych "Evangelists" (1911, Russian Museum), while in her Paris years the same kind of artistic passion was conveyed in the "Spanish Women", The polyptych "Spanish Women" (19231926) features not only the same multi-part arrangement, but also the characteristic greatly elongated vertical format of the compositions: it was not for nothing that one critic compared Goncharova's "Spanish Women" with Gothic cathedrals27. This most famous among Goncharova's polyptychs has quite a complicated history, Several years ago researchers discovered28 that Goncharova produced a copy of this work or, rather, a largely similar piece, shortly after completing the original, In 1924 the polyptych "Spanish Women" was exhibited, and in the same year one of its images was printed, with a date stamp "1923", on an invitation to the Bal Banal, which Goncharova helped to design, Two years later, in 1926, the polyptych was bought by Mary Hoyt Wiborg: Larionov informed his Japanese acquaintance Iwata that Goncharova "sold to America her 5 Spanish panels for 80,000 francs"29. 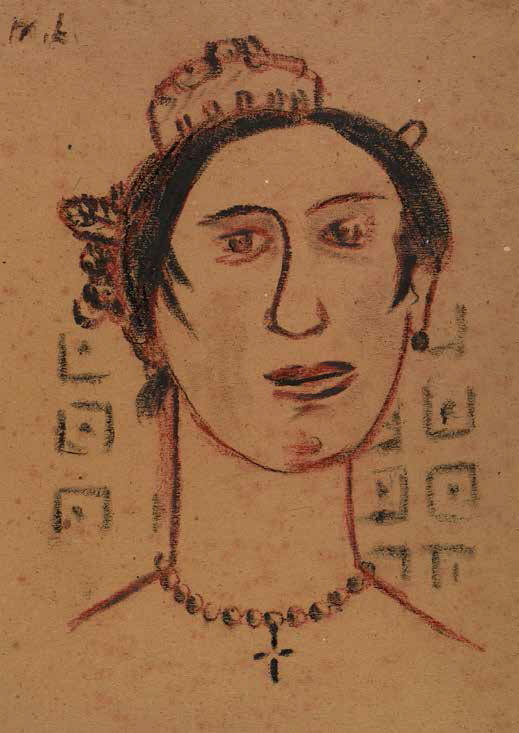 The character of the purchaser, Mary Hoyt Wiborg (1888-1964), deserves closer examination, A wealthy American woman who wrote film scripts, Wiborg had lived in Paris since the 1920s while paying regular visits to America, She collected avant-garde art, including Goncharova's, and in 1922 actively participated in the organization of her large exhibition at the Kingore Gallery in New York. In the mid-1920s Goncharova accomplished a panel, focused on the Wiborg family history, for Mary Wiborg's mansion. 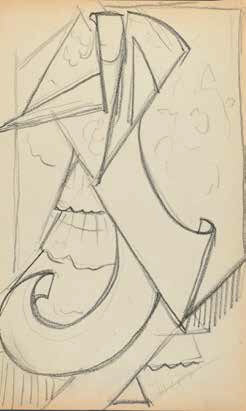 But there were other ties between Goncharova and the Wiborgs as well. Mary's older sister Sara and her husband Gerald Clery Murphy moved to Paris at the same time as Mary, in 1921. Impressed by the Parisian artistic scene, the couple suddenly decided to study painting, and Goncharova became their tutor and even recommended them as unpaid assistants for manufacturing sets. As for Mary Wiborg herself, she, unexpectedly, became a "co-creator" of Goncharova's art. In 1927 the "Spanish Women" reached America, as Goncharova infomed Larionov30. In the same year the panels with the images were re-assembled to form a screen on Mary Wiborg's instructions, and displayed in this form at the Arts Club of Chicago. 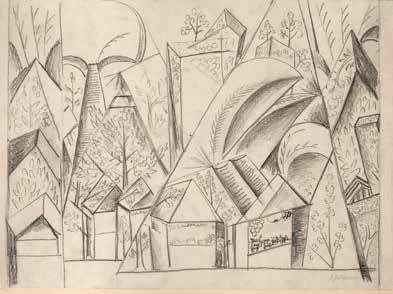 As an unexpected consequence of this "voluntaristic" design, Goncharova received many offers to produce screens. The numerous sketches for these screens are held at the Tretyakov Gallery, with a screen with scenes from Parisian life at the Moscow Museum of Modern Art. The subsequent fate of the "Spanish Women" shipped to America is anybody's guess: for a while the screen belonged to Sophia Loren, but its present whereabouts are unknown. 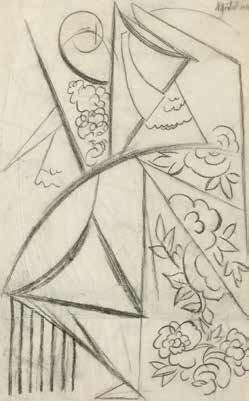 For Goncharova, parting with her creations was always unpleasant. According to Marina Tsvetaeva's record of Goncharova's words, "sending her Spanish women overseas... Goncharova sought consolation by creating exact copies of these images, repeating them, for herself, to keep. And what? 'The colour is different. And some figures are differently wrought.' And the task was - to reproduce. "31 By June 1926 the second version was completed and displayed at an exhibition in Dresden32. This polyptych remained in the artist's studio until the early 1950s; photographs of Goncharova in her studio feature this second version in the background. 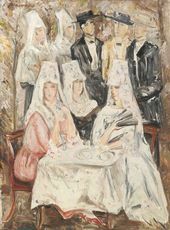 Later, separate pieces ended up in different museums, including the Tretyakov Gallery, the Centre Georges Pompidou, and the Musée d'Art Moderne de la Ville de Paris (City of Paris' Museum of Modern Art) and were put together again, for the first time after separation, at the exhibition "Natalia Goncharova. East and West" in 2013 at the Tretyakov Gallery. During her entire Parisian period, Goncharova repeatedly addressed Spanish themes. 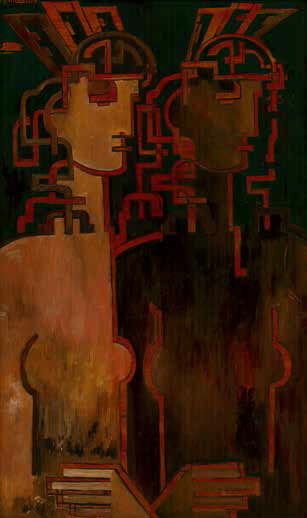 They became for the artist an experimental territory, a reflection of the exploration of forms and styles. It appears that any idea - whether an interest in a new material, an artistic impression, or a literary plot that fascinated Goncharova - everything had to be seen, calibrated and reflected in this "Spanish mirror". 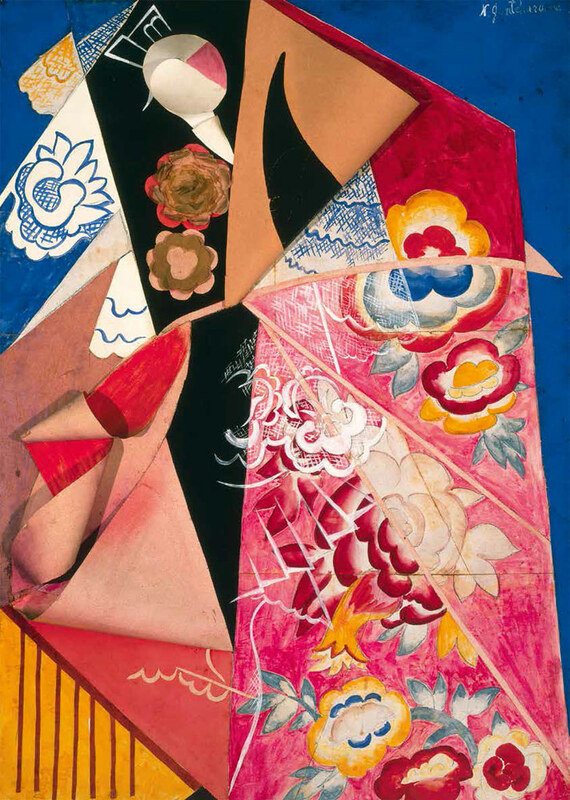 That was how a new series of "Spanish Women", made with the use of the technique of imitation inlay on wooden boards, came into being; the panels of a disassembled cabinet, on which Goncharova painted her compositions, were now put together to form diptychs and triptychs. Édouard Manet's celebrated “Le déjeuner I'herbe" comes to mind when one looks at the “Breakfast. Spain" (1925-1926, Tretyakov Gallery) - they, too, are resting in a forest, although at a table. The compositions “Autumn Evening. Spain" (19221928, Tretyakov Gallery) and “Spanish Women with a Dog" (1922-1928, Tretyakov Gallery) feature figures that seem cut out of tin-plate. The elegant white Spanish women, which were called by the artist exactly that - “Spring. 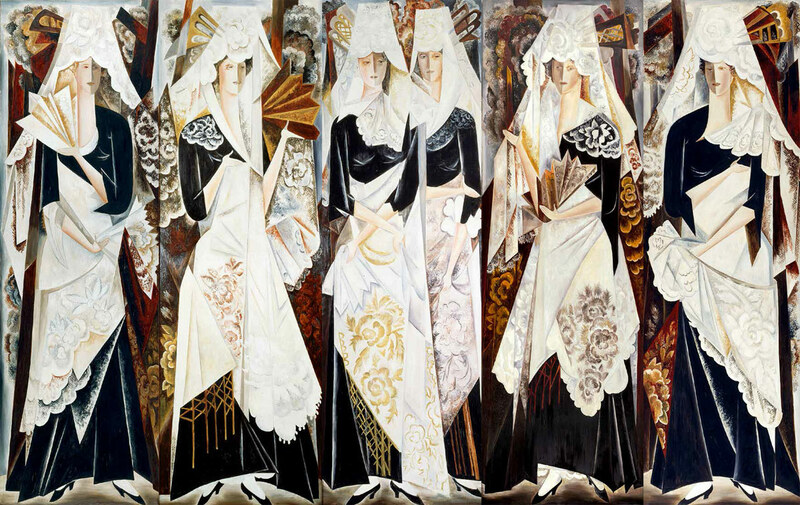 White Spanish Women" (1932) - are confronted by the “Spanish Women" clad in black mantillas and purple mourning dresses (“Spanish Women", first half of the 1930s, Tretyakov Gallery). 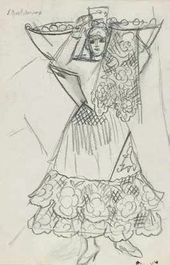 Perhaps the regular assignments for designing theatrical productions themed on Spain gave Goncharova an additional impetus to create new images of Spanish women. It is not by chance that one of the Spanish female images - a half-figure in a mantilla (the sketches are held at the Tretyakov Gallery and the McNay Art Museum) is believed to feature Tamara Karsavina, the first performer of the Miller's Wife in “Le tricorne" choreographed by Massine. Finally, Goncharova herself is featured in a portrait by Larionov as a black-eyed Spanish woman with a high comb in her hair. As if for posterity, Larionov thus “secured" Natalia Goncharova's ties to her second “artistic" homeland, which had given her such new opportunities for creative work. “Les contes russes" (Russian Fairy Tales) were three choreographed pieces to Anatoly Lyadov's music. 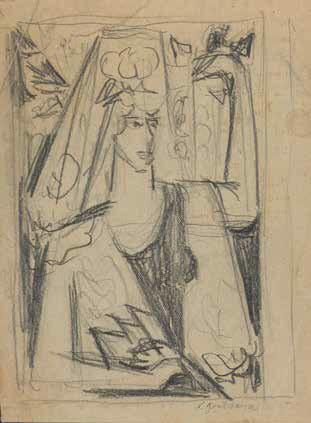 Directed by Léonide Massine, décor and costumes by Mikhail Larionov with the participation of Natalia Goncharova, San Sebastián - Paris - London, 1916-18. “Les contes russes” included the ballets “Kikimora", “Baba Yaga", “Bova Korolevich and the Swan Princess"
Late in his life Larionov wrote in his memoirs; “The King of Spain visited nearly every night rehearsal. He loved ballet so much, and once, during a performance of de Falla's 'Le tricorne' at Teatro Real in Madrid, he was watching Woizikowsky's steps with such admiration that he performed several steps himself, asking whether it looked like Woizikowsky's." (Department of Manuscripts, Tretyakov Gallery, fund 180). However, it should be noted that “Le tricorne was produced in 1919 and premiered at the Alhambra Theatre in London. 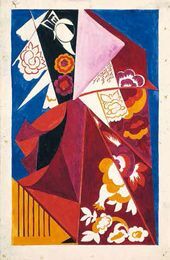 Goncharova, Natalia. “A memoir about the production of the ballet 'Les noces’ (The Wedding)". Department of Manuscripts, Tretyakov Gallery, fund 180, archived unit 45. Léonide (Leonid Fyodorovich) Massine (1895-1979) was a dancer and choreographer who worked for Diaghilev's “Ballets Russes" in 1914-21 and 1924-28. Karsavina, Tamara. “Teatralnaya [Theatre] Street", Moscow; Iskusstvo, 1971. P. 215. Enrique Fernandez Arbos (1863-1939) was a Spanish violinist, conductor and composer. Lydia Lopokova (1891-1981) was a ballerina who joined the Diaghilev company on its first international tour in 1910, and worked for the Diaghilev “Ballets Russes" in 1915-1924 (with intervals). Ninette de Valois (real name, Edris Stannus, 1898-2001) was a ballerina and, from 1931 to 1963, artistic director of the Sadler's Wells Theatre (since 1957, the Royal Ballet of Great Britain). Goncharova is wrong about this; Ninette de Valois worked with the Diaghilev company in 1923-1926. Leon Woizikowski (1899-1975) was a dancer and teacher who worked with the Diaghilev company in 1916-1929. Lydia Sokolova (real name, Hilda Tansley Munnings, 1896-1974) was a dancer with the Diaghilev company in 1913-1929 (with intervals). Stanislas Idzikowski (1894-1977) was a dancer with the Diaghilev “Ballets Russes" in 1915-1929. Goncharova, Natalia. “A memoir about the production of the ballet 'Les noces' (The Wedding)" Department of Manuscripts, Tretyakov Gallery, fund 180, archived unit 45. “Triana", a ballet to the music of Isaac Albéniz, and “Spain", a ballet to the music of Maurice Ravel, were two unrealized projects. 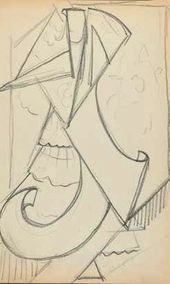 Léonide Massine would be responsible for choreography of the production, Goncharova for its design. 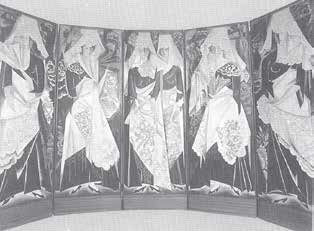 Stravinsky's ballet “Les noces', directed by Bronislava Nijinska, designed by Natalia Goncharova. Premiered on June 13 1923. Developing the production from 1915 to 1923, Goncharova created many sketches of the sets and costumes, including the “Composition with Industrial Chimneys" (1916-1917, Tretyakov Gallery). “Liturgy" is an unrealized ballet production themed on the life of Christ. With a desire to convey in the costumes the austere canonicity of medieval art, Goncharova envisioned dresses made of stiff cloth restricting dancers' movements. Caryathis (real name, Elisabeth Toulemont, 1888-1971) was a dancer who worked in Paris in the 1920 s under that name. Eganbyuri, Eli. 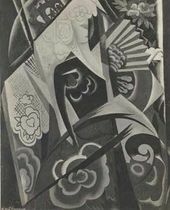 “Cubism in Theatre" [1920-1921]. Department of Manuscripts, Tretyakov Gallery, fund 180, archived unit 3. The folio “L'Art Ddcoratif Theatral Moderne" (Modern Theatrical décorative Art) was published for the show of the same name featuring Goncharova's and Larionov's stage designs for Diaghilev's productions, which was hosted by the Sauvage (1918) and Barbazanges (1919) galleries. Bronislava Nijinska (1890/91-1972) was a dancer, choreographer and teacher in 1910-1913; in 1917 she danced with the Diaghilev company, and in 1922-1924 worked there as a choreographer. In 1932-1935 she directed her own company. In 1932 she directed Ravel's “Bolero" at her company, Theatre de la danse Nijinska. De Falla's “Love the Magician", directed by Leon Woizikowsky. Les Ballets de Leon Woizikowsky, 1935. Enrique Granados (1867-1916) was a Spanish pianist and composer. “Goyescas" is a ballet to his music directed by Victor and Tatjana Gsovsky. Theatre Marigny, Paris, 1940. Victor Gsovsky (1902-1974) was a choreographer and teacher. Tatjana Gsovsky's husband. Tatjana Gsovsky (1901-1993) was a ballerina, choreographer and teacher. “Quinta del Sordo" (Villa of the Deaf) is a series of 14 frescoes (1819-1823), created by Goya to adorn his house, which had been called “Villa of the Deaf" during the previous owner's lifetime. These images, reproduced on canvas one by one since 1974, are now held at the Museo del Prado in Madrid. Department of Manuscripts, Tretyakov Gallery, fund 180, archived unit. Preparing an academic catalogue of Goncharova's paintings held at the Tretyakov Gallery, Irina Vakar discovered that there were two versions of the polyptych. More about this subject; “Tretyakov Gallery. A Catalogue of Its Collection. Paintings; 1900-1950. Vol. 6, Book 1, from A to I" Moscow; 2009. P 232. Department of Manuscripts, Tretyakov Gallery, fund 180, archived unit 544. Goncharova's letter to Larionov (Department of Manuscripts, Tretyakov Gallery, fund 180, archived unit 589). International Kunst-Ausstellung; Amtlisher Fuhrer und Katalog durch die Ausstellung. [Dresden], 1926. A Spanish Woman with Oranges. 1916. Natalia Goncharova. Costume Espagnole. 1917-1918. Natalia Goncharova. 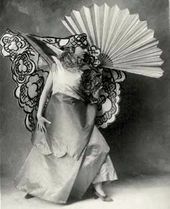 Spanish Woman with a Fan. 1916. Fair Booths. Set design to the ballet "Triana", music by Isaac Albeniz, direction by Leonid Myasin (not staged). 1916. Composition with a Spanish Woman Figurine. 1910s-1920s. A Spanish Woman. Costume sketch. 1910s-1920s. Monster. Costume design to the ballet "Goyescas", music by Enrique Granados. Directed by Victor Gsovsky. Théâtre Marigny, Paris. 1939. A Spanish Woman. 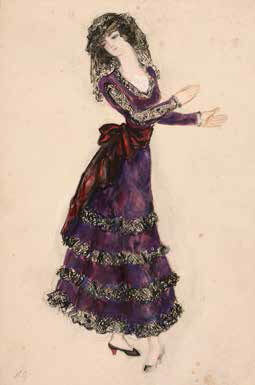 Costume design to the ballet "Goyescas", music by Enrique Granados. Directed by Victor Gsovsky. Théâtre Marigny, Paris. 1939. Autumn Evening (Spanish Women). Between 1922 and 1928.